This October in Moscow was held a tender during which Armenia was chosen as the venue for the test drive of new Honda Pilot (the third generation). Our «Arara» Company has received a request for the organization of this major event and we are pleased to announce that we were able to create all the necessary conditions for its carrying out. Thirty leading Russian auto journalists came to Armenia on the appointed date and tested the cars for several days. 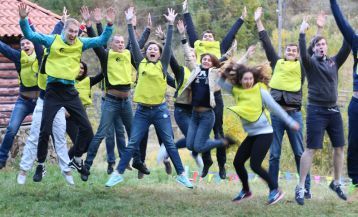 Besides the testing itself, the event was accompanied by the visit to the most popular attractions and beautiful corners of Armenia. On the first day, the guests went to the city of Echmiadzin – the religious center of all Armenians and the residence of the Catholicos of the Armenian Church. 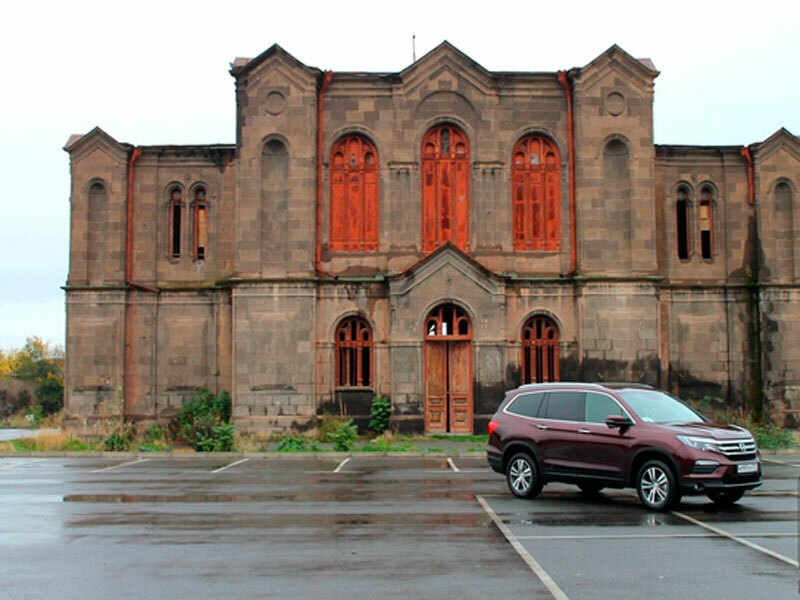 There after a brief presentation of new Honda Pilot model and a delicious lunch consisting of national Armenian dishes, the journalists took part in the exciting excursion to the Echmiadzin Cathedral. During the tour, the guide told that the cathedral was built in 301 after the adoption of Christianity in Armenia and it became the first Christian church in the world. 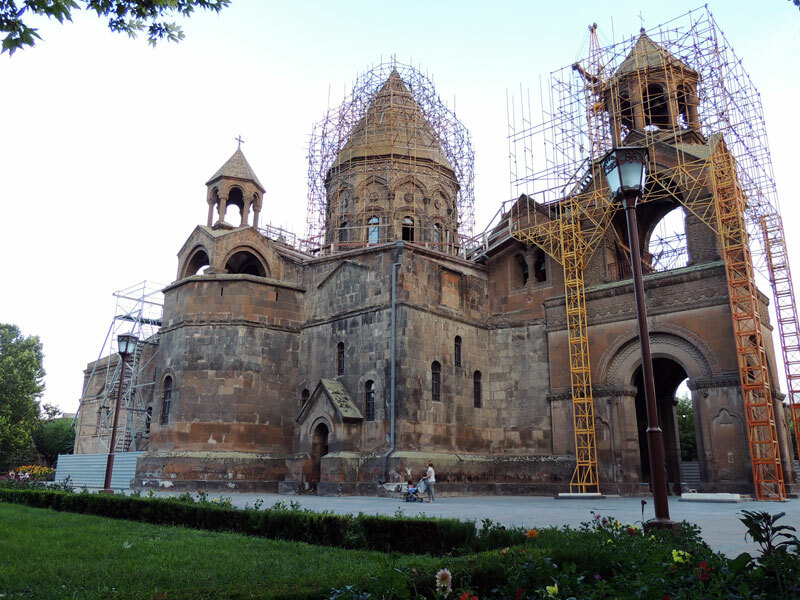 According to the legends, the place for its construction was shown to Gregory the Illuminator (the founder of Christianity in Armenia) in his dream. Now the cathedral is under reconstruction, but in spite of this you can go inside and enjoy its splendor. After the excursion, the journalists «saddled» again their Honda horses and head to the capital of Armenia – Yerevan. Strolling around the city streets, they saw one of the largest and most famous constructions in Yerevan – Cascade. The Cascade is a huge stair that connects the lower part of the city with the upper residential area. It is surrounded by the park, which can be called a true museum of contemporary art thanks to the unique statues belonging to well-known foreign sculptors. 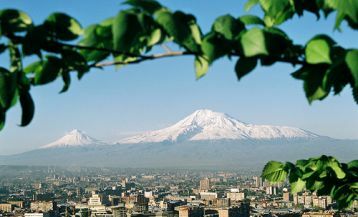 If you climb the top of the Cascade you will be able to enjoy a magnificent view of Yerevan and Ararat from the observation area. The second day the guests went to Lake Sevan – the pearl of Armenian nature and one of the largest freshwater lakes in the world. This place was perfectly chosen: nature is amazing! Huge Lake Sevan, which is sometimes called “the Armenian sea”, is located so high above sea level, that sometimes it seems that it is about to touch the sky. 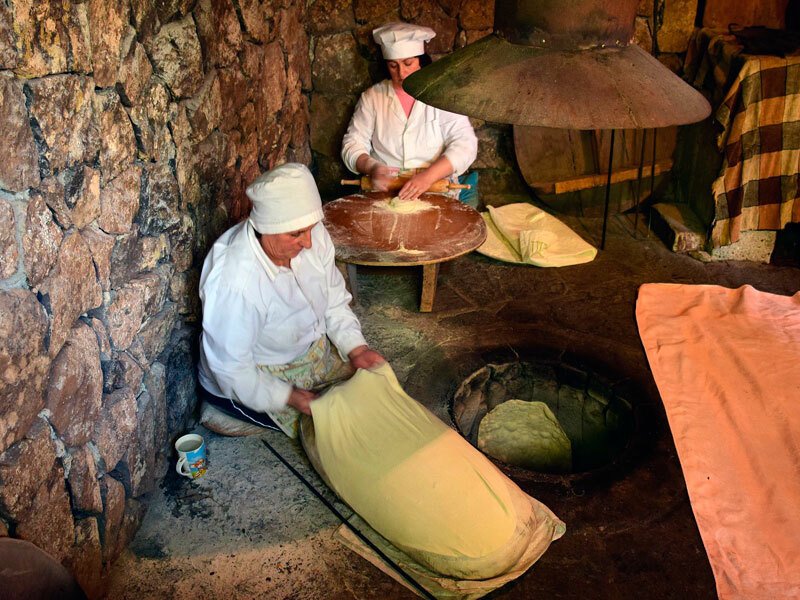 In Garni village which was the next destination, we arranged for our guests a demonstration of Armenian national bread «lavash» baking. Did you know that this already known around the world bread is included in the UNESCO list of intangible heritage? 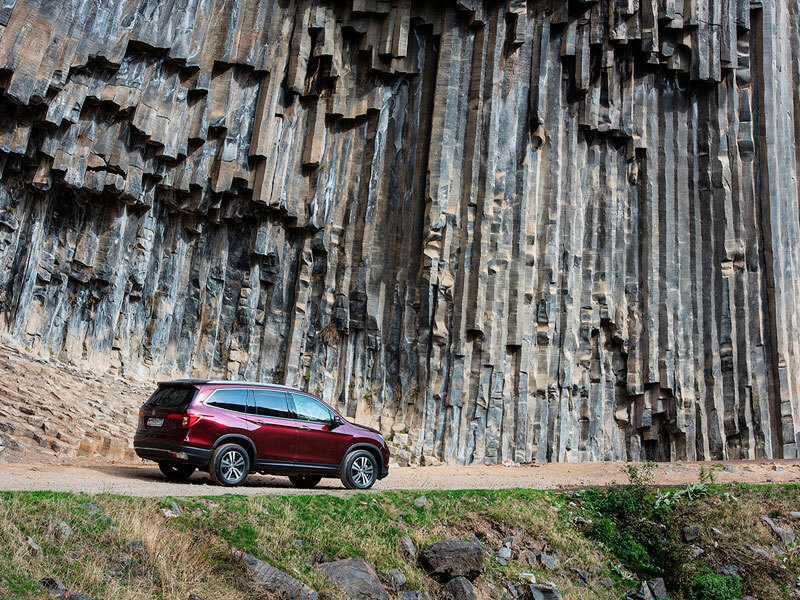 In Garni canyon, they visited the unique «Simphony of stones» which consists of basalt columns formed after the volcanic lava effect. As a result of these geological processes appeared this symmetrical natural monument which is also called «the basalt organ». Indeed, if you look at the valley from afar, many of the cliffs seem like a giant organ. The test drive was beautifully finished by a jazz concert in one of the famous jazz clubs of Yerevan. And that is not by chance: Yerevan is sometimes called «the jazz capital of Armenia», as this musical direction has been playing here more than seven decades and is performed perfectly! 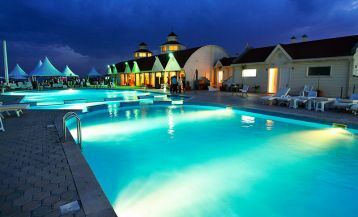 In this way ended the journey around Armenia and the testing of the new stylish model of Honda. After some time auto journalists who participated in the event summed up the event end wrote detailed reviews on the work done. As it was noted in some of their published articles the third-generation Honda Pilot is much more spacious and comfortable than its predecessors. The main thing in it is an internal volume, the ergonomics, and the incredible salon sound insulation. It will enter the market only in spring of 2016 and the price will become known no sooner. It must also be noted that besides the car description the journalists didn’t leave unattended the beauties of Armenia, noting the majesty of our nature and uniqueness of attractions. Special admiration was left by the visiting of Garni Gorge and the ancient Armenian churches.